Legacy of the Claw, by C. R. Grey – book review by Fred Patten. Legacy of the Claw, by C. R. Grey. Illustrations by Jim Madsen. Map by Kayley LeFaiver. NYC, Disney•Hyperion, October 2014, hardcover $16.99 (295 [+ 1] pages), Kindle $9.99. Legacy of the Claw is Book 1 of the Animas series, described by reviewers as like a combination of J. K. Rowling’s Harry Potter series and Philip Pullman’s His Dark Materials trilogy. In the Kingdom of Aldermere, all humans are magically bonded to an animal from birth. A human is known by the animal that he is bonded with; Animas Cat, Animas Horse, and so on. People travel with their life-bonded Animas padding, hopping, or flying with them; Longfoot the hare, Dillweed the badger, etc. “Civilized” people – farmers, townsfolk – have domestic or small forest animal companions. Bailey Walker, 12 years old, has just graduated from his local school and been accepted by Fairmount Academy, the most prestigious institute of higher learning in Aldermere. He is enthusiastic about going there, and scared because he will be traveling alone. Bailey is an orphan, adopted as a foundling baby by the Walker farmers; and although they have been loving foster parents, they could never get Bailey to bond with an Animas. Bailey hopes that the teachers at Fairmount can help him find his Animas, but he is equally scared that not having an Animas will be grounds for expulsion, or will make him a freak and a social outcast during his adolescent years. “Bailey couldn’t wait to board. The two rigimotive cars were like giant red metal houses, with four rows of copper-rimmed windows looking out on the plains. Gold-painted spiral staircases inside each car reached all the way to the top. The yellow dirigible, a huge oval balloon, floated above the rigimotive. “‘Do you believe all the stories about the lost tribes of the Velyn [a little-known mountain range]?’ Bailey asked Hal. According to the stories, the Velyn were a mysterious group of men and women who’d been tough enough to live up there in the mountains, mostly because they shared the Animas bond with powerful beasts like grizzly bears, wolves, and giant mountain cats. Legacy of the Claw establishes on page 3 that the murdered King Meliore had a baby son who disappeared and was thought dead, so the reader is led to suspect that the missing prince is connected with Bailey. He can’t be Bailey, because the murder and disappearance happened 27 years earlier and Bailey is only 12. But it is in the background all through the book. But Gwen’s more dangerous experiences force her to develop her bond with not only Grimsen, her owl, but in new directions with all owls. Viviana plans to end the Animas partnership and make all animals the slaves of the humans. Legacy of the Claw builds up speed and suspense for a rousing conclusion that answers some questions but sets up more drama to come in Book 2. There is no indication of how many Animas books there will be, but four or five is the usual number for Young Adult fantasy series. The action runs from adolescent school events to political scheming, betrayal, and murder. Grey’s writing is brisk and witty: “‘Here we go,’ said Roger with the enthusiasm of a slug about to encounter a trail of salt.” (p. 29) The illustrations by Jim Madsen, who also did the cover, are chapter headings only. From a fantasy animal viewpoint, Legacy of the Claw is a bit disappointing. The Animas-kin are more like loyal pets than talking animals, though when their human is in danger, they act with more devotion and intelligence than normal animals. The villains also each have a bonded animal that assists in their treachery, and they are usually “evil” animals like wolves and vultures. Legacy of the Claw is enjoyable reading. 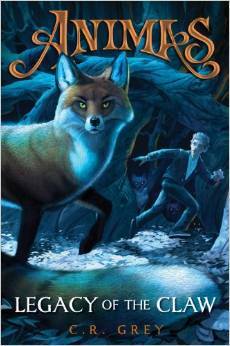 Young Adult fantasy series like Animas are designed more for the public library market than for individual sales, so there is a good chance that you can find this for free at your local library instead of needing to buy it.